Technology adoption has spun the way healthcare and pharma industries are operating these days. These industries are on the forefront in adoption and integration of Virtual Reality, Augmented Reality and Mixed Reality, says Ninad Chhaya, COO, WITS Interactive and Co-Founder and COO, GoPhygital, in conversation with Rajbala of Elets News Network (ENN). What is the scope of Virtual Reality (VR), Augmented Reality (AR) and Mixed Reality (MR) in pharma and healthcare sector? With the introduction of faster and smarter technology, pharma and healthcare have progressed fast. Virtual Reality, Augmented Realty and Mixed Reality are helping companies and researchers to adopt newer ideas leading to the improvisation of equipment maintenance, patient care, etc. Patients can describe their symptoms better through Augmented Reality. Invoking empathy – Healthcare companies are currently using Virtual Reality to demonstrate what it feels like for a patient to experience medical conditions such as migraines and vertigo. Treatment of Post-Traumatic Stress Disorder – By using Virtual Reality simulations, patients relive their most traumatic events in a safe and controlled environment. Technology integration supports physical therapy, pain management, hospital or doctor visits, surgical training, maintenance of labs, etc. Doctors use Augmented Reality as a visualisation and training aid for surgery. It may also allow collection of 3D data sets of a patient in real time using sensors like magnetic resonance imaging (MRI), ultrasound imaging, or CT scans. Interestingly, these technologies would provide surgeons access to all types of data simultaneously which will enhance their field of view with more efficient information. Augmented Reality might also be useful for training purposes. Virtual instructions could help surgeons to implement required steps instantly. 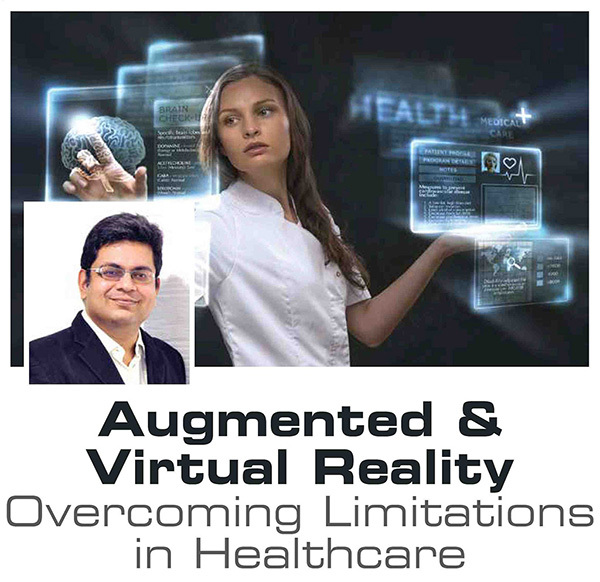 What are the key factors hampering growth of Augmented Reality and Virtual Reality (in pharma and healthcare)? According to me, the two key factors for AR and VR not getting acceptance in the mainstream are cost and time. If such technologies are executed well, they can deliver results on a completely different level as compared to usual methods. High cost, lack of clear regulatory guidelines for medical use, scarcity of trained healthcare professionals to operate devices are some of the key factors hampering the growth of Augmented Reality and Virtual Reality in the industry. However, high cost could impact the adoption of AR and VR devices. The choice and investment on the technology will influence the delivery of VR experience. Moreover, such technologies will go mainstream once the headsets become more affordable and accessible, along with the quality of content improving across the board. On the other hand, Augmented Reality as a technology and a medium is growing at a really rapid pace and businesses across the globe are adopting it to meet their business objectives. This is primarily because unlike VR, which needs investment in specific hardware to experience the content, Augmented Reality can be experienced on any smartphone/tablet, which is getting cheaper and more powerful. Companies in this industry need to adopt these technologies depending on what the end objective is. Return on Investment should not be looked at just from a pure cost perspective but also from the value that the investment delivers. Matter of fact is that these technologies have the potential to deliver truly engaging, potentially life changing experiences. Creating awareness for the technologies beyond these two verticals could change the way companies interact with their audience. What is the success rate of these technologies in upcoming years from India perspective? VR, AR and MR are slowly being adopted in India among the Healthcare, Retail, Entertainment, Education, Publishing and Industrial sectors. With hardware getting faster, smarter and cheaper, the scope of implementing these technologies in India is starting to take-off. Currently there are numerous AR and VR apps available on multiple platforms. As compared to a website or a mobile app which most brands use as a current means to engage with their users, VR, AR and MR have the potential to give a greater emotional resonance to objects and topics. By engaging users, the technology creates a highly compelling and enjoyable experience. Users experience multiple scenarios in real time without the need for making decisions based on one-dimensional representations. In addition, the Gartner Hype cycle for emerging technologies, 2016, states that AR and VR are expected to become a driving force for businesses in the next 5 to 10 years. These technologies bring immersive opportunities and leveraging them will not only help save time and money, but also transform ideas/experiences that could possibly disrupt the current business landscape in India. How have Augmented and Virtual Reality technologies in healthcare are offering high growth opportunities for players active in the industry? Augmented Reality and Virtual Reality are gaining prominence among medical personnel for various applications ranging from surgical training to rehabilitation. Various healthcare IT-enabled companies are venturing into the AR/VR healthcare market to capitalize on the high growth opportunities they offer. According to reports, the projected multi-billion dollar market is expected to grow at a robust double digit CAGR during 2016–2024. Internationally, medical schools like the John Hopkins School of Nursing, pharma companies like Abbott and GlaxoSmithKline Pharmaceuticals Ltd, have already incorporated AR and VR in to their business practices. Moreover, these technologies carry enough potential to enhance the learning process, provide high-level interaction with the learning content, and can foster active engagement by students and trainees to adapt to entire new capabilities and experiences.